I fancy myself a bit of a risk taker when it comes to trends. I’ll always give a rising style a whirl even if it doesn’t actually suit me. A new trend is like a delicious dessert. I try to say no, but in the end, I’ll inevitably take a bite. As I dissected the myriad of S/S 19 runway trends, there was one that stopped me in my tracks. I shuddered at the thought of trying it. Next to shoulder pads and neon, ’80s acid-wash jeans made a star appearance all over the runways—at some of my favorite designers—from minidresses at Isabel Marant to A-line skirts at Proenza Schouler and high-waisted mom jeans at Balmain. 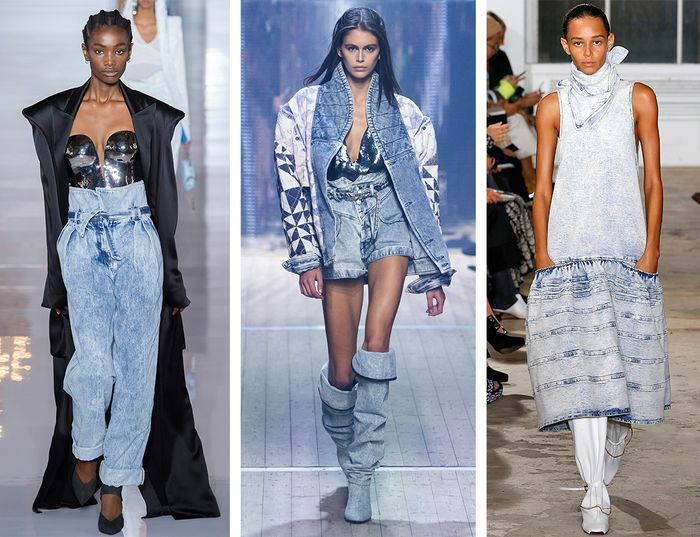 The hard-to-stomach-denim trend that, up until now I only ever associated with Saved by the Bell was now slowly winning me over one catwalk at a time. But how in the name of Kelly Kapowski do you pull off this tricky trend in real life? The key is to approach your bleached speckled denim no different than distressed jeans. For an off-duty look balance boyfriend jeans with a crisp white tee and sneakers. Want a more polished outfit? Pair tailored jeans with a tweed jacket and sky-high heels. For a night out, opt for a cool-girl bleached dress with slouchy boots. Celebrities and fashion girls such as Kendall Jenner, Rosie Huntington-Whiteley, and Katy Perry have already been spotted wearing acid wash jeans showing us that it’s easier to pull off than we think. Ready to give it a go? 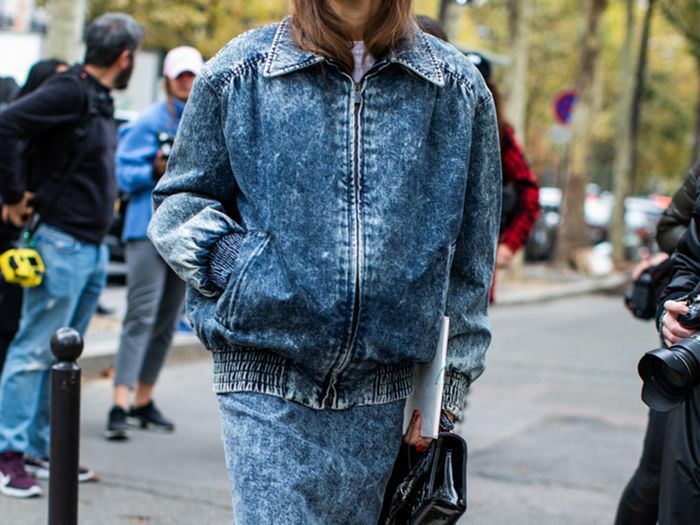 Scroll below to see how fashion girls wear the trend and shop the coolest acid-wash pieces before everyone else does. Style Tip: Skip the skinnies and opt for loose boyfriend jeans instead. Tan accessories will elevate the look. Style Tip: A streamlined silhouette from head to toe looks fresh and modern. Finish the look with sleek black accessories to add polish. Style Tip: Layer your look with a smart blazer and trench coat. Pretty pointed-toe shoes add a sweet contrast to the edgy fabric. Style Tip: Channel the ’80s and wear them high-waisted cinched with a belt. Prim and proper tweed adds a sophisticated touch. Up next, how to wear white jeans like you know what you're doing.